David Risley is proud to present “Fallback”, an exhibition of new paintings by Danish artist Thomas Hylander. Many of the works were made for the exhibition during a stay at the gallery’s residency at Krogerup højskole in Humlebaek – an area where Hylander spent several summers as a child. The paintings in "Fallback" revisit the places of his childhood. Much of Hylander’s work is based on memories of Humlebaek and the paintings in the show are the result of his first extended engagement with the source of his memories and subject. "I most often start with an idea about a place or an event and then I try to paint something that echoes the original experience”, says Hylander. "When I think of my early childhood memories I imagine that me and my son's eras fuse and we are peers. That way my son becomes a travelling companion when I create paintings from memory", Hylander explains. Hylander’s paintings can be regarded as an archaeological excavation – in both the metaphorical digging and scraping into his memory and their physical appearance. The surfaces show the layers of time and a washing and rubbing back to reveal the genesis of the work. With a restless but optimistic belief in the medium's possibilities Hylander strives to hold on to the feeling and atmosphere of the first glance. In his attempt to recall the places from the past the works undergo a transformation and the paintings become like a travelogue. Thomas Hylander was born in Denmark. He lives and works in London after graduating with an MA in Fine Arts from the Royal College of Art in 2004. 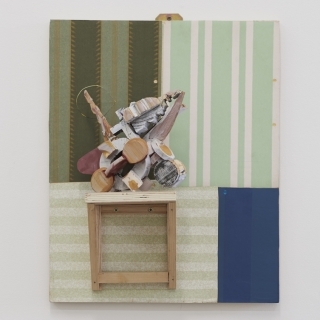 In 2009 Hylander had a solo show at Vilma Gold gallery in London. He has exhibited at Jerwood Contemporary Painters, London, Hauser and Wirth, Zurich and Bloomberg New Contemporaries as part of Liverpool Biennial. He has paintings in several prominent collections including Samlung Essl, Austria and Tate Modern, UK.